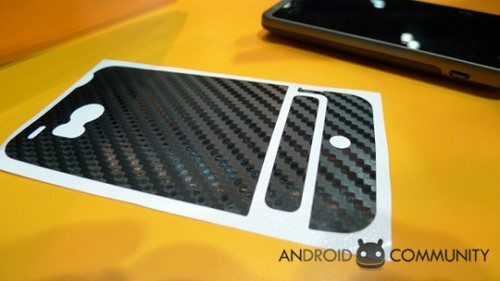 So now that you have finally got your 4G surfing HTC Thunderbolt in your grasp you may list like to beautify the Android 2.2 Froyo smartphone up a tad with say a custom carbon fiber armor skin. Well while at CTIA 2011, the guys over at Android Community and Slash Gear were contacted by BodyGuardz and asked to check out their BodyGuardz Armor skin for the HTC Thunderbolt and the guys captured the occasion on two videos, which of course we have for your viewing pleasure below. According to the BodyGuardz website the BodyGuardz Armor Carbon Fiber for the HTC Thunderbolt is a strong PVC based film with a carbon fibre texture that is custom designed for each device and adds no bulk to the HTC Thunderbolt whilst protecting the smartphone from scratches. In the video footage from Android Community you get to see the Armor skin attached to the HTC Thunderbolt so you get an idea on how easy it is to apply the three-piece custom cut skin to the device. In the video footage from Slash Gear we also get to see what the custom carbon fiber-ish skin looks like when attached to the Motorola Xoom along with other skins for the Apple iPad 2, and again how to apply the skin to the HTC Thunderbolt. I have to say that applying the new skin did look reasonably easy, and when done does make the devices look cool. The BodyGuardz Armor Carbon Fiber skin for the HTC Thunderbolt can be purchased from BodyGuardz for $19.95 and includes the ScreenGuardz Ultra Touch Screen Protector, micro-fiber cleaning cloth, one back skin and a squeegee. NoNoNo, dnt want that crappy skin on my thunderbolt( which i brought the day it arrived )4g. According to that guy he said it's permanent after 3 or 4 days.Is it just me but i perfer to see all around my phone da name & da 4g logo & that goggle brand. now lets not get it twisted i'll buy some protective cover 4 the phone but not no skin i know i can't get rid of + it costs too much duckets( $19.99 ) for just 3 pieces, a waist of time & money spent.